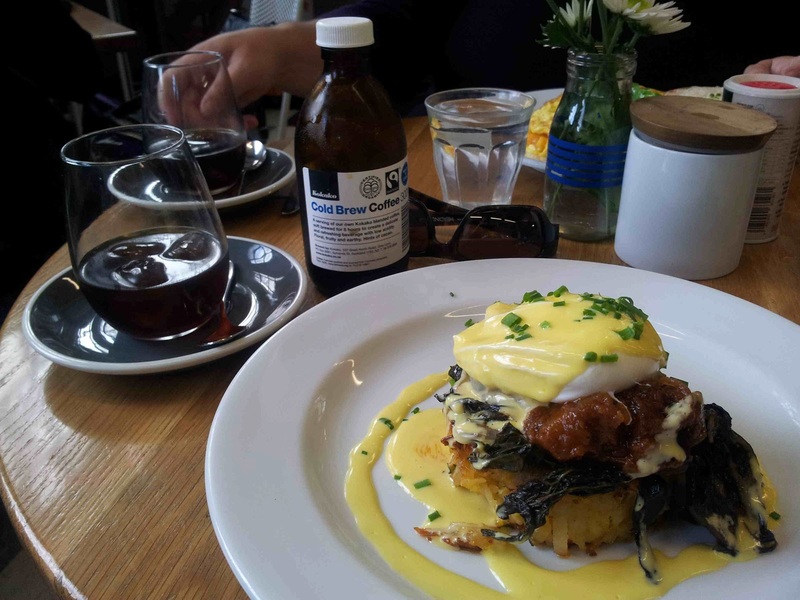 We had brunch today at Kokako Cafe & Roastery in Grey Lynn and had two excellent meals and two different types of cold coffee (because we could). Kokako's menu features organic vegetarian cuisine and is located in an old post office that has lots of character. I had the Organic Potato Hash which consisted of organic free range eggs, hollandaise, a smoked eggplant relish and some braised greens. It was a superb dish that I would definitely order again. Jane had the Organic Free Range Omelet that was filled with organic pumpkin, feta, red onion jam and more. It was also accompanied by a thick piece of ciabatta. The omelet itself was a decent size and the flavours complemented each other nicely. For coffee, I had Kokako's Cold Brew Coffee which is soft brewed for 8 hours and very mellow to taste. Served with ice in a beautiful glass that accentuated its aroma, it was a very different flavour to what I expect from an iced coffee. It also came with the remainder of the coffee in a jar that made it look like medicine (which coffee obviously is). I started off really not sure if I liked it or not but by the end was enjoying it a lot more but still not 100%. Jane had Kokako's Cold Drip Coffee which had been filtered for 4 hours through a cold drip. I found the taste of it to be quite bizarre but Jane in fact preferred it over mine. The food arrived in a timely manner but the staff could learn how to smile and actually engage with their customers.